Last weekend was TNNA in Columbus. It was one of the better shows. There were lots of new vendors and plenty to see. I showed great restraint in the Cash & Carry department but I did bring home a few things. I spent most of my time thanking companies that have supported us the past year. I have had to do quite a bit of follow up on the yarn for designers. I don't know what is going on but it took much longer to get the designers the yarn. I'm still waiting for one more delivery but the yarn is coming from Canada which is the problem. I think most of my students are on vacation! I've reviewed a few lessons but not many. 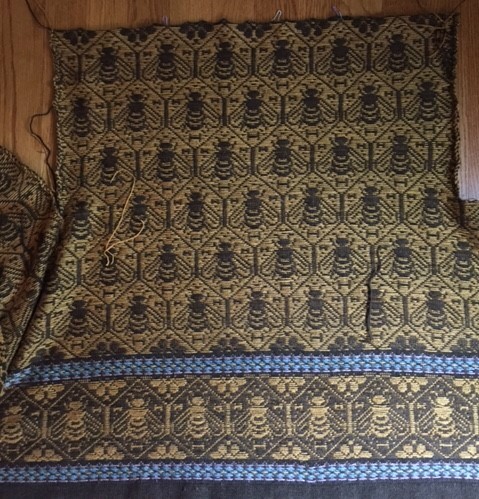 It has given me time to work on my bee sweater. My last entry was about grafting in pattern. 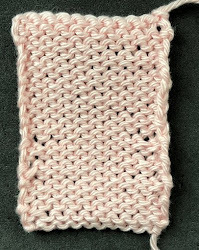 That technique really doesn't work for K1P1 ribbing since the half stitch offset cannot be hidden. If you absolutely have to graft single rib and you want it to look good, there is really only one option. There are several drawbacks to this technique. It is a major pain to do (more about that later) and it doesn't produce true ribbing. You have to lower your expectations. If you are expecting it to be as elastic as regular ribbing you will be disappointed. 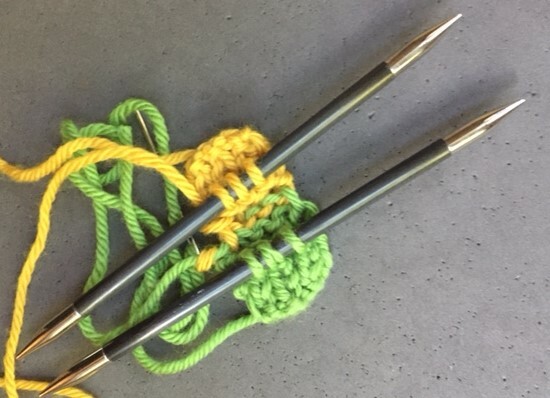 Basically how it works is that you place the knit and purl stitches onto separate needles and you first graft the knits stitches on one side together and when you finish that, you turn the needles over and do the same for the other side. The photograph below shows this preparatory step. Notice that you have to use four needles. I recommend using needles which aren't slippery. I used carbon needles and even then stitches were slipping all over. In the photograph below I have grafted one side and have turned over the needles to graft the other side. The area of the graft will be a bit puffier than the surrounding stitches and will not be as elastic. The photo also demonstrates a potential issue. You have to be careful when you transfer the stitches to separate needles. It is very easy to split a stitch and then you have to contended with that when you graft. I wish I could say I intentionally split that stitch as a demonstration but, alas, I didn't mean to split it. Here is the final product and you can see that the "graft" is a bit puffier. I'm not wild about this technique and I have only used it when I have worked the bands on a sweater as part of the fronts. When you finish the front necklines, you work the band stitches separately, seam them to the back of the neck and have to either seam them or graft them at the center of the neck. This isn't terribly noticeable so it isn't the end of the world that it isn't perfect. Here is the link to the video: Grafting K1P1 ribbing. I won't be having salon this week as I have weekend plans, very rare for me. 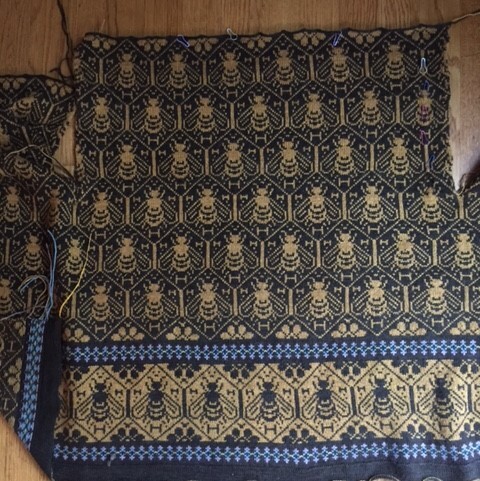 I am still working on the bee sweater but the end is in sight. I forget what a lot of work a project like this is. I'm almost done with the first sleeve. Here is the RS of the body. 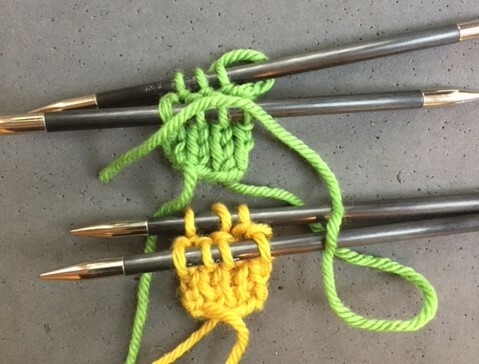 I always get flak from knitters who think I should knit these things in the round. Here is a photo of why I knit them flat. My stranded tension is so much better when I work them this way. I'm hoping to have it finished by my next posting. I still have to knit 3 pairs of gloves for the next issue! Gorgeous! And thanks for the grafting tutorial. Loved your blog. The best one.